On Saturday 3rd November Marina and I were fortunate enough to join Trevor Glass and the Conservation Department team as they went to Inaccessible and Nightingale Islands. The trip was made to drop off Leo Glass, George Swain and Julian Repetto. Tristan and Kieran Glass came along and the crew were Trevor, Justin and Matthew Green. This was out first time out on the new Blue Belt funded RIB which has yet to be named. We were very impressed. It is a really important vessel for the conservation team to be able to conduct surveys around Tristan and the outer islands. 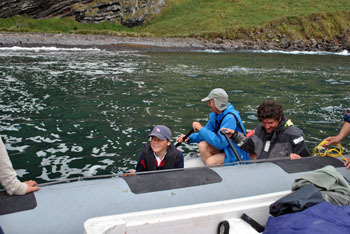 The landing was smooth although a few of us did get wet disembarking from the dinghy! 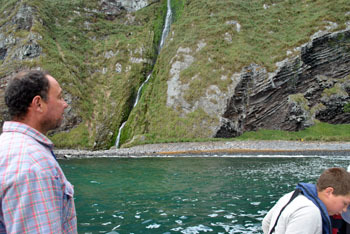 Once ashore we caught up with Ben Dilley and Peter Ryan. Peter has been there since the arrival of the Agulhas and Ben joined him when the Agulhas departed. He had been on Nightingale. 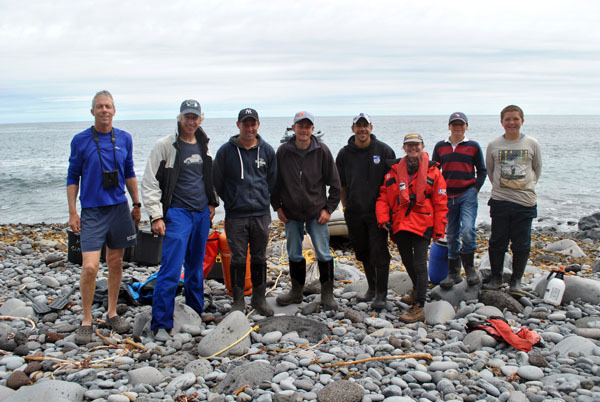 They are doing important bird science and monitoring and the Tristan team will be with them for two weeks or so as they continue that work. We also made a quick trip to The Waterfall where Peter wanted to make a survey of invasives. Early next year we have a team of three coming out who will be tackling the influx of flax. They will be camping at the Waterfall. After returning Peter to Blenden Hall we then headed over to Nightingale where we met up with James Glass who was conducting some camera drops with Steve Swain and Connor Glass. Rob Mrowicki and Rodney Green were diving at the time. The wind started to pick up so skipper Trevor decided it was time to head back. 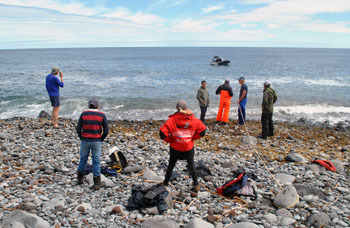 A great day out to see the important work conservation and fisheries are doing. The Tristan Conservation Department hut in the centre was first constructed by the Denstone Expedition to Inaccessible Island in 1982. Blenden Hall offers the only safe path from the coast to the plateau above via the tussock covered slope behind. 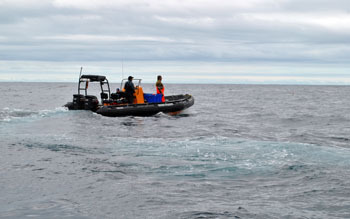 with the RIB anchored offshore. Left to right - Peter Ryan, Ben Dilley, Julian Repetto, George Swain, Leo Glass, Marina Burns, Kieran Glass and Tristan Glass. Kieran, Trevor, Tristan and Peter en route to The Waterfall. Matthew looking towards Waterfall Beach. about to set off for Waterfall Beach. 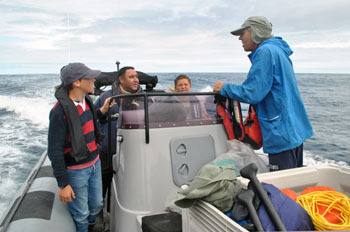 Head of Fisheries James Glass with colleagues Steve Swain and Connor Glass aboard the Fisheries RIB Jasus Tristani. Rob Mrowicki and Rodney Green were diving at the time.